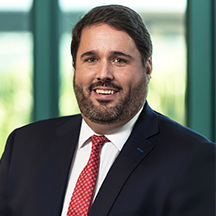 Travis Hayes is a shareholder of Grant Fridkin Pearson, P.A and has practiced law in Southwest Florida since 2005. Travis focuses his practice in estate planning, estate and trust administration, and probate and trust litigation. He is a frequent speaker and author on estate planning and estate and trust administration topics. He was recognized in the 2018 edition of The Best Lawyers in America in the area of Trusts & Estates, and he holds an AV Preeminent peer review rating from Martindale-Hubbell. Travis is a member of the Executive Council for the Real Property, Probate & Trust Law (“RPPTL”) Section of The Florida Bar and currently serves as the Chair of the RPPTL Probate Law and Procedure Committee. He is a past Vice-Chair of the RPPTL Legislation Committee and a past Vice-Chair of the RPPTL Digital Assets and Information Study Committee. Travis is a past Chair of the Probate Rules Committee for The Florida Bar. Travis is a Fellow of the American College of Trust and Estate Counsel (“ACTEC”). He currently serves on the Fiduciary Litigation Committee and the Fiduciary Income Tax Committee for ACTEC. He has been named by Florida Trend magazine in its Legal Elite edition as a top “Up & Comer” and by Super Lawyers as a “Rising Star” in Florida. Travis was selected as one of the Top 40 under 40 Trusts and Estates attorneys in the State of Florida for 2015 and 2016 by the American Society of Legal Advocates. In recognition of his service to the RPPTL Section, Travis was awarded the At-Large Member of the Year award in 2014 and the Rising Star award in 2018. Travis is a past Chair of the Trusts & Estates Section of the Collier County Bar Association. He is currently serving on the Board of Directors and as Treasurer of the Collier County Bar Association and the Collier County Bar Foundation. Speaking engagements throughout the State of Florida (including recent presentations in Miami, Fort Lauderdale, Palm Beach, Orlando, Tampa, St. Petersburg, Clearwater, Sarasota, and Fort Myers) to Bar Associations, Estate Planning Councils, and other Trusts & Estates-related groups.